With the rise of behavioral economics courses undergraduates are seeking more formal training and instruction in behavioral economics topics. 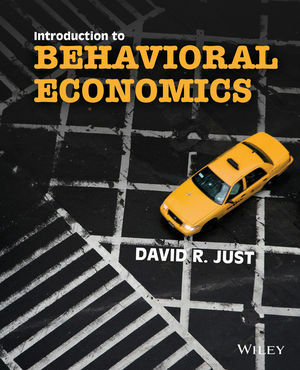 Introduction to Behavioral Economics covers all the ways consumers and other economic agents behave in an irrational manner, and prepares readers to make rational economic choices. This book is focused on the broad principles of behavior, which are illustrated using real-world examples, examples from experimental literature, as well as experiential examples. All examples are drawn from news items, historical accounts and the economics literature. Experimental examples are drawn from the economics literature and are in the form of classroom experiments that complement the principles of the book. David Just is Associate Professor and Director of Graduate Studies in the Department of Applied Economics and Management at Cornell University where he regularly teaches undergraduate and graduate courses in econometrics, microeconomics, and behavioral economics. Professor Just's areas of expertise are behavioral economics, risk and uncertainty, and information while his research interests center around the use of information, and more particularly, how differences in human capital and information availability affect decisions. Just received his Ph.D. from the University of California, Berkeley in 2001.? His professional activities include Board Member, Northeast Agricultural and Resource Economics Association; Committee Member, American Agricultural Economics Association; and Honor Societies, Phi Kappa Phi, Golden Key, Alpha Lambda Delta, Phi Eta Sigma, Omicron Delta Epsilon. Use of a wide range of examples: real-world examples, examples from experimental literature, and examples from laboratory exercise. Experiential examples put students in the position to experience the effect of behavioral economics themselves. Text is organized in a more user-friendly format—by behavioral principles—rather than by topic and diverse experiments with conflicting results, like many other textbooks. Text is flexible enough to appeal to a wide variety of audiences, and instructors can determine rigor, specifically when it comes to treatment of mathematical models. Significant discussion of management and policy implications, as well as the potential impacts of behavioral theory on welfare economics and policy.